The stars finally aligned, good people! My current old faithful. My vertical stacked, old reliable, always ready smoker was showing strong signs of wear. Old girl’s firebox bottom was thin with holes beginning to appear. She burned many a log and lump of coal. Her racks were getting weary. The support system was leading towards the point of no return. Believe me! She can still cook! Though, she is tired and needs a rest. Well, wouldn’t you know it. After hours of asking around, chasing down picture after picture on Craigslist from Jax to Tampa, and driving the back roads of central Florida hoping to find a gem like this at the end of the dirt driveway for sale, I finally found him. 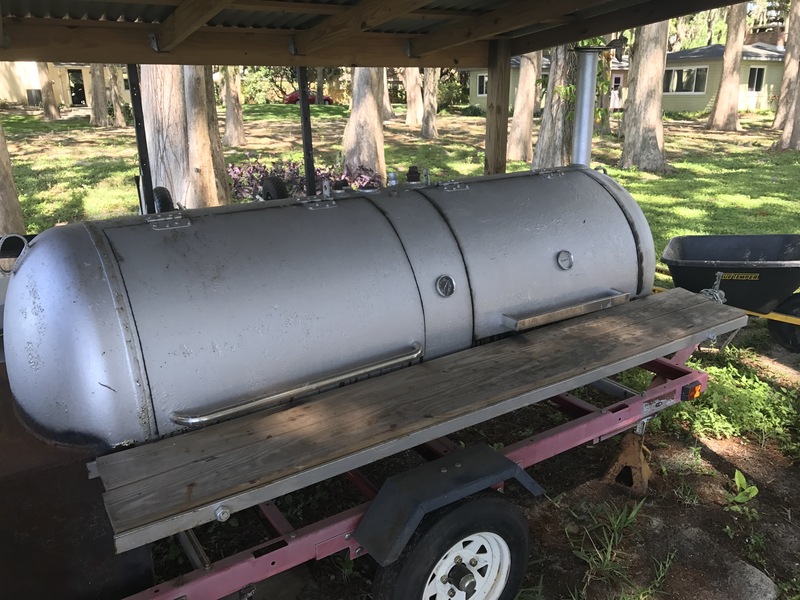 This bold, eight foot long, king of the BBQ smoking jungle appeared in a small, sleepy town of Eustis. It’s funny. I almost didn’t go. I was finding my patience and will wearing thin. I had a string of bad luck searching for my replacement of my current smoke warrior. Go to Lowe’s, you say. Not a chance. I was not about to get caught in the four year, replacement rotation another year! I was going to wait. Search. Be selective. I saw a lot. A lot of crap. Junk. A scrap man’s motherload, but, no smoker. Oddly enough, the home of this bionic bomber is minutes from my Mom’s place. Fellas, you know. You gotta stop in and check on momma. I figured I’d make a quit pit stop, swipe a glass of tea, and chit chat for a few. I figured one way or another, I was a winner. So along comes Darr. Darr is the current road manager of this silver beast. He has had it parked under his carport. He would hold regular backyard BBQs for coworker and friends. Believe me, he lives in FL paradise. The minute Darr introduced me to this beast, I knew we needed to get to know one another better. This was a custom job. Darr walked me through where he got the materials, why he designed the personal features of the rig, and shared a few stories of the kind of joy this baby can bring! Thankfully, our careers had crossed paths. We knew like people. It eased the negotiations. It was a definite win/win. Previous This is what Sunday is all about!